Right after World War II, between the US and the then Soviet-Union there was a continuing state of military, political and economic tension, characterized by a roughly 45-year period of, among other things, a nuclear arms race. 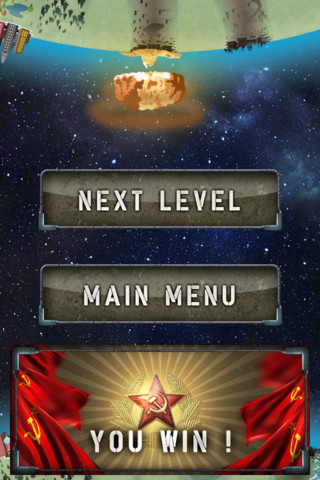 Although none of the two got to use their nuclear weapons, you can re-enact that war and put both the US and the Soviet Union’s nuclear capabilities to the test in Nukes for iOS. The game is easy to play, but just as easy to finish, giving it in the end a low replay value. In Nukes, the single player version, you control one of the two Cold War super-powers: the US or the Soviet Union. No matter which one you choose, the game play is the same. You take turns and fire your nukes at the enemy’s cities. A direct hit on an enemy city will destroy it, and the first one to destroy all will win the level. When you take your turn, you will notice that the opponent’s cities spin around on the globe in the top half of the screen. When the Earth rotates them into view, all you have to do is tap launch (lower-left) and watch the nuke blast towards the city. If you fired it at just the right time, it will hit and you have one less city to worry about. Anything other than a direct hit won’t count. 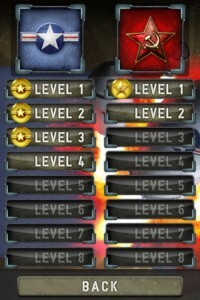 The game has 8 levels for the Soviet Union and 8 levels when you play the US. It will take you under 30 minutes to finish. The first six levels of each are easy enough for a toddler to get done, but the final two are more difficult. In the first levels, you have more cities than your opponent, which means you need to destroy far less cities than he has to. But in the seventh level for example, you have just as many and your only advantage is that you take the first shot. The enemy won’t miss a shot, so neither should you if you want to win it. 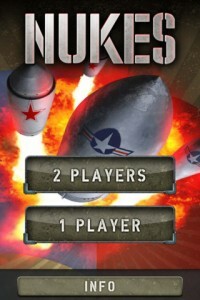 The game also features a two-player mode, where you challenge a friend on the same device and launch nukes in turns. You can decide how many cities you will need to destroy as well. The game is no doubt entertaining and the last two levels will challenge you enough to want to play them. But here are a couple of ideas that might make the game much more fun. Power ups. Especially in the last two levels, you need to make sure that absolutely all your shots count. The AI won’t really miss any, so that makes it a race indeed. But what if you could have some power ups, like protect a city or counter-measures for an incoming nuke. These power ups could be picked up by launching a nuke at them as they fly by the screen (satellites perhaps). This might add some strategy to the game as well, as you would need to make a decision, most of the times, of whether you want to hit an enemy city or pick up a power up with your next shot. Achievements & Multiplayer. Why not integrate the game with GameCenter and have achievements built in. Stuff like “Eagle eye” for finishing a level without missing a single shot. Multiplayer through GameCenter or via WiFi might also want me to challenge friends who are half way across the world, instead of relying on close proximity to play a friend. 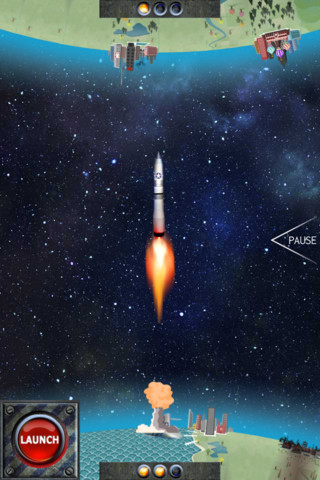 So if you’re looking for a quick time waster, Nukes is your choice. But if you want to get engaged in a game, then you best continue looking. For 99 cents, the game has all it needs to keep you entertained for about an hour. What do you think of Nukes ? Scroll down for our comment section and let us know!